Tangled: Before Ever After is a 2017 American 2D-animated musical fantasy television film produced by Disney Television Animation, that premiered on Disney Channel as a Disney Channel Original Movie. 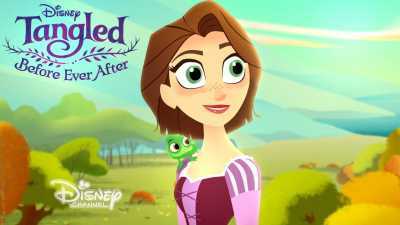 It takes place between the original Walt Disney Animation Studios film Tangled and the short Tangled Ever After, and serves as the pilot to Tangled: The Series. It was directed by Tom Caulfield and Stephen Sandoval. The film centers around Rapunzel’s adjustments to the life of a princess, and the mysterious return of her 70 feet of magical, golden hair.